Thong Guan | Blog - Is Stretch Wrap Recyclable? Everyone is talking about reduction in packaging. These days it’s all about going green and being environmentally friendly. However, is it a good idea to recycle stretch wrap? Stretch film is made, most of the time, of linear low density polyethylene (LLDPE). Can it be recycled? The answer is yes. Low density polyethylene is denoted as category four in recycling. So when should you recycle stretch film? The answer is always. In fact, only 5.4% stretch film is recovered each year, a figure that is way too low. Are you aware that the most valuable recyclable material in your warehouse center may be stretch wrap? This means not only can stretch film be recycled, it’s actually a great idea to recycle them. To save thousands of pounds of stretch wrap per year, everyone should in fact, consider recycling -- this will also mean dollars saved or dollars spent. Don’t forget that stretch wrap is perhaps the largest component of warehouse center’s waste stream. By eliminating stretch film from the waste stream, a company/manufacturer/country can decrease the number of pulls, which translates to saving on money. Plus by reducing the volume of solid waste needed to be thrown away, and lowering your transportation costs, yearly trash bill can be reduced tremendously. Contact a recycle company for assistance and to arrange pick-up. Determine and design a collection and handling system. Educate employees who will be in charge of the program. Use a quality control program. It is also a good idea to contact vendors to let them know that you have a recycling program. Ask them to keep tapes and labels off the stretch wrap and not to use tinted films. In order to let everybody know about the recycle program, place collection containers clearly labeled, and conveniently located in your warehouse center. There should be a container marked “Stretch Wrap Only” and another one for “Plastic Only”. A good location to place the containers would be in receiving or in processing areas. A container should be located in shipping and near the stretch wrapper. Your first opportunity to recover stretch wrap is when you are receiving. So when stretch wrap is taken away from pallets, it should be placed in collection containers immediately. Remember stretch wrap is tacky and if it is placed on the floor, it will pick up dirt and other contaminants. Click HERE to know more about the History of Stretch Wrap. Finally, the key to success of your stretch wrap recycling program is your employees. It is very important to make sure they understand the importance of their contribution. Explain to them your company environmental goals and emphasize their roles. Accentuate that tapes and paper labels must be removed and are serious contaminants. Make sure they do not use recycling containers as trash receptacles. Recognize that permanent employee education and motivation are essential to long term success. It is essential that you and your employees have a firm commitment for the recycle program. And once you’ve started a recycle program for stretch wrap, it is a good idea to expand to other areas as well, such as office paper and bales corrugated. Recycling stretch wrap presents several opportunities. A successful program can offer great economic benefits. Plus diverting stretch wrap from trash bins will save energy and preserve resources. As you can see, recycling is a worthy goal, but one should also consider using less films too. So how much stretch wrap should be used? That depends on a number of variables, with one of them being the weight of the film. Once the pre-stretch, gauge and wrap pattern are optimized for the required containment force, then film should be cut and weighed. The bottom line is that you should recycle more stretch wrap and use less, if one is keen on saving money and helping the planet. 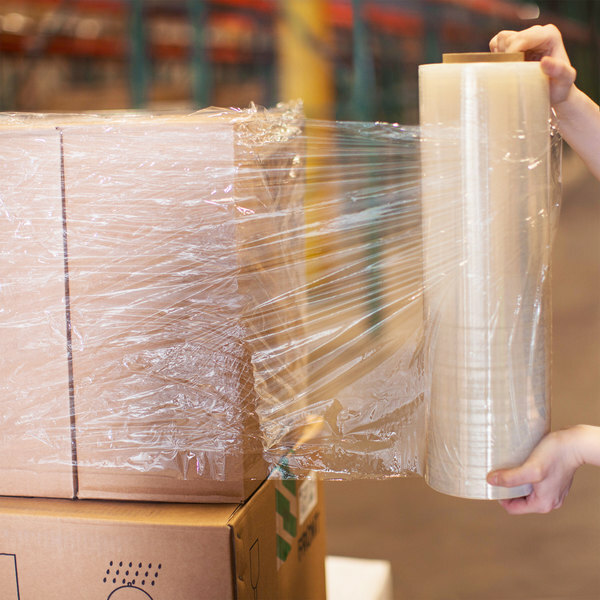 *Recommended reading: What is the difference between stretch wrap and shrink wrap?